I've attached a photo of the 1st of the ex Plymouth Solo to enter service with Go North East - 709 (Plymouth 209). This is now the regular bus on the Nexus secured service 13, a local route in West Newcastle-upon-Tyne. You will note that it has been fitted with Hanover LED destination in lieu of the green it arrived with, and has also been retrimmed in Go North East moquette with hand poles repainted in the light blue used by Go North East in its new buses. SN66WLK needs to be added on to your fleet list as well as 220-224 now with go north east. 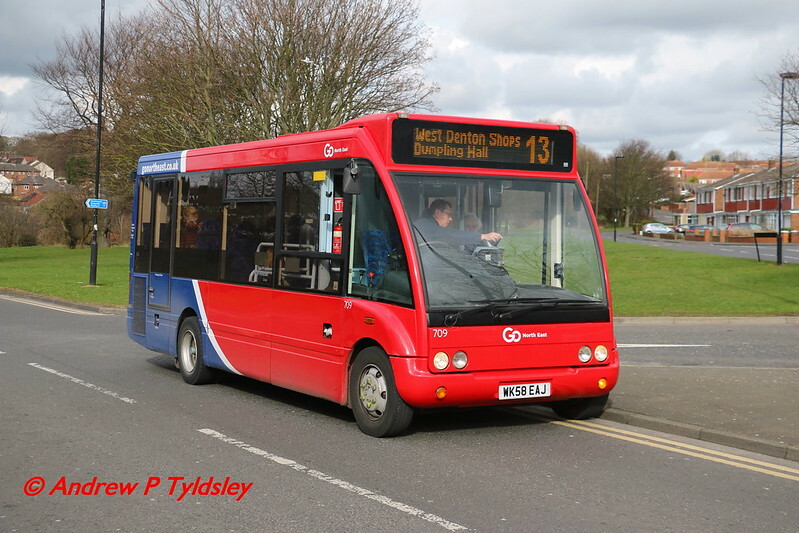 Ex Plymouth Citybus B7TL (412 PL51LGC) is seen with Xelabus. Slightly off topic, but what buses are used on the 45 and 46? I was just wondering. Is it the 370-373 batch? PCB 45 was on 13 today,Trev in trouble again? One of Aline Coaches new optare solos was on the road yesterday (14/03/2017). Graham, you could create a special fleet list of the old western greyhound fleet from before the devastating fire on the 13 may 2013. All of the buses that were involved in the fires in summer court and liskeard should also be included. So then graham, what about updating your city bus sheet as SN66WLK needs to be added and all of the optares now sold. You note that Go NorthEast has replaced the green destination display with an orange one. Are there any buses left now - around Plymouth or elsewhere in the country - with the distinctive WG green displays?